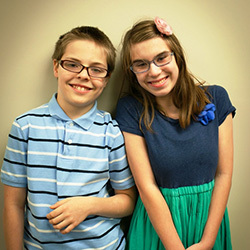 Laurel and Steve Smith adopted two Russian children – Gabby, 13, and Duncan, 11 — when the children were very young. While Gabby and Duncan have progressed in their decade here, some of the effects of the trauma they endured haven’t been erased. Both children spent time in orphanages, hospitals, as well as private residences, where they were both neglected. Exactly what the children experienced is unknown. Gabby was adopted when she was 25 months old and when she arrived here she was 15 pounds, 27 inches – the size of a typical 4-month-old in the United States. Thanks to hormones, she has grown to about 4 feet 11 inches tall and 80 pounds. Her “hyper vigilance” and rigidity are signs of post-traumatic stress disorder. Duncan was adopted when he was about 8 months old. He was diagnosed with attention deficit disorder that later developed into Asperger's syndrome. Both of the children have problems with food and “will eat anything” because they were not well-fed in Russia. In fact, Duncan prefers his food cold because that is what he is used to. Both have also been affected by a lack of love and affection during infancy, including being held or coddled. That’s why their parents, Steve and Laurel, came to Easterseals Michigan and took advantage of the new LUNA Model program that helps children with trauma. The Smith family still receives services at Easterseals Michigan and is thriving now more than ever. They enjoy their therapy sessions at Easterseals and are growing into happy, healthy young adults. After two years of consistent work in the Autism Center and the classroom, Jaxson has made great gains. He has increased his joint attention and plays with toys other than balls including cars on a track, participates in bowling and jumps on a trampoline. With the help of a communication device, Jaxson has made a big break-through and can express his wants and needs. Jaquish says, “Not only does he activate the button on a device to say “hi” or “bye”, Jaxson will spontaneously shift his gaze and look at the individual he is greeting with a smile!” At the end of the day, he’s glad to see his “Poppy”. Every day is a new learning experience for three-year-old Jaxson. 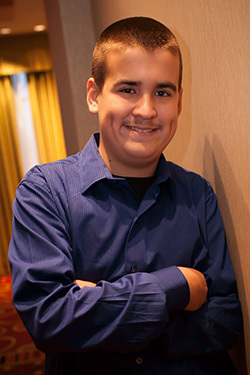 The team approach at Easterseals UCP has made a significant difference in Jaxson’s life. The Easterseals Greater Houston transition team met Paul and his mother in June of 2017 when he was a client in the Hogg Foundation for Mental Health Transition Age Youth Project of Easterseals Greater Houston/DARS. Thanks to the Hogg Foundation, this project offers services and support for persons aged 16-27 who have autism and a co-occurring mental illness, and is designed to help youth become more independent and successful in their communities. The many facets of the program include social skills training, supported employment, summer internships, college classes at the Houston Community College VAST Academy, BCBA Services, peer supports, referral assistance, financial coaching, online driver's education and access to Easterseals Greater Houston's mobile technology program. Paul had just graduated from Sam Rayburn High School in Pasadena, Texas. His only work history was as a volunteer through a high school program with a couple of companies in the Pasadena area. Paul and his parents wanted him to find a part-time job with a number of specific requirements such as close to home, with work hours after 4:00 p.m. throughout the week. Together, Paul and his transition counselor, Robert Arranda, created a resume reflecting his volunteer experience and a reference list of his former supervisors. They met to complete online applications, practiced mock interviews and reviewed social skills for interviewing techniques. Paul interviewed with companies through summer and fall. In December, Wal-Mart called Paul in for an interview. His Transition Counselor says he is a very likable and responsible individual and that he really wants to show his parents that he is able to expand his learning curve and become more independent. Paul’s interview at Wal-Mart was a hit with the Human Resources Department, and he was hired this past December as a Cart Attendant. Wal-Mart was very accommodating assisting Paul with the work schedule he needed. Within two months, Paul’s supervisors noted his great work ethic, enthusiasm and customer service. 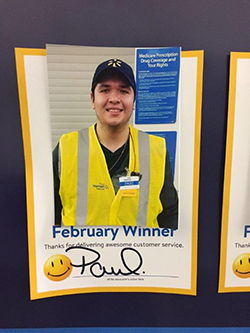 Paul was selected Wal-Mart Employee of the Month for February! 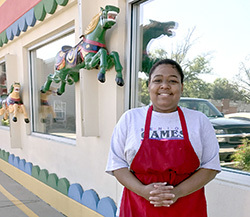 Finding a job wasn’t an easy task for Kendra Jones. In fact, before finding her way to the Easterseals Rehabilitation Center’s New Frontiers Employment Services, Kendra had very little interaction with non-family members. Kendra has autism, which sometimes makes connecting with others a difficult task. That’s where Keith Lender came in. Keith is a job coach with New Frontiers. He helped Kendra develop social skills through outings to the mall, the library, and other community locations. Kendra wanted to work at a restaurant, so Keith helped her find a trial position at The Carousel Restaurant in Evansville. He assisted Kendra in learning the job skills she needed. She did so well, her supervisor Robin Wade offered Kendra a permanent position. Kendra celebrated two years at The Carousel in February. Keith said he never saw Kendra smile until she started her new job.Prior to working with Keith and New Frontiers, Kendra was shy and lacked confidence. Now Kendra has a newfound independence. She rides the bus to and from work each day and to purchase art supplies for her favorite hobby. The Easterseals Rehabilitation Center’s New Frontiers Employment Services helps adults with disabilities who want to work discover their own interests and abilities and learn social and daily living skills. Job coaches also teach clients how to search for jobs, prepare resumes, apply for jobs and prepare for and go to interviews. Keith said the goal is always long-term employment. Alex was diagnosed with autism at a very young age. He was a happy and loving baby, but did not meet his physical milestones. He took his first steps on his second birthday after an entire summer of physical therapy. He did not speak until he was 5 years old and still has difficulty communicating. Things did not come easy for him but he worked extremely hard. As he got older, the signs of his autism became more apparent, and his family expanded the therapies in which Alex participated. Kids with autism resist physical movement. It was the goal of his parents to make moving, exploring and trying new things part of Alex's normal everyday life. That is how Easterseals Michigan, through the Miracle League of Michigan baseball program, came into their lives. They started 8 years ago with the baseball program and since then, have participated in the bowling, football clinic, and dance program. At Easterseals Michigan, Alex gets to discover that he has no limitations. He has come a long way over the years, and people who meet him know him as a terrific young man with a great sense of humor. Miami native Robert L. Becera, 21, has non-verbal autism and communicates with the world through his iPad. His mother and father assist him with many of the activities of daily living. At Easterseals South Florida, Robert loves being part of the Culinary Arts High School Program, working in the kitchen where he thrives in a teamwork environment of his classmates and peers. 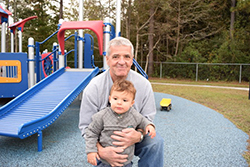 Outside of Easterseals, Robert has made a positive impact on thousands of lives in South Florida. He was recently honored on the US House floor by Congresswoman Ileana Ros-Lehtinen for his role in Law Enforcement & Fire Rescue Training for the past 11 years on behalf of the Autism Society of Florida, where his mother, Teresa Becerra, serves as Executive Director. Over the years, he has helped train more than 9,500 Miami Police Officers, firefighters and EMTs to identify people with developmental issues and tailor their actions and responses accordingly. With Robert’s help, officers and first responders in South Florida are trained to de-escalate volatile emergency situations involving individuals on the autism spectrum or with mental illness. 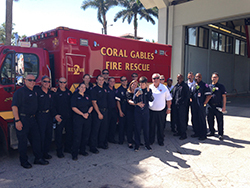 Robert’s assistance and emergency response training has not only helped officers to connect with special needs young adults on an emotional level, it has also had a positive impact by broadening first responders’ real-world perspectives, potentially saving lives in South Florida.